Fritillaries find butterfly weed irresistible. Long ago I willingly surrendered in the battle to maintain a lawn as a monoculture of exotic grasses like fescue or zoysia and as a result, floristically speaking, my yard has become quite diverse. I’m not sure exactly what elements of nature conspired this spring, but violets have rapidly become the preeminent ground cover in shady spots and landscape beds around my home. While weeding last week, I noticed significant nibbles and bites at the margins of the omnipresent violets and upon closer inspection discovered several glorious larvae of the variegated fritillary grazing on the leaves. Violets throughout the garden are food for fritillary caterpillars. These tiny caterpillars are the spawn of small orange and black butterflies that first appeared in my landscape more than a month ago. In northern states the variegated fritillary is a migrant, moving ever northward from its winter redoubts in the Carolinas. I have to wonder if the early appearance of variegated fritillaries this season was from hardy stock that somehow survived the nonexistent winter locally, or if their prompt arrival merely indicates an earlier than usual departure from their overwintering home down south. Whatever the reason, the fritillaries have arrived and for the remainder of summer and well into autumn they will be regular visitors to open sunny areas such as fields, pastures, and along the edges of roads where females consume pollen and nectar from butterfly weed, milkweed, dogbane, and red clover. When they are ready to lay eggs, females seek nutritious plants such as maypops, mayapple, purslane, stonecrop, plantains, and moonseed on which to lay eggs. 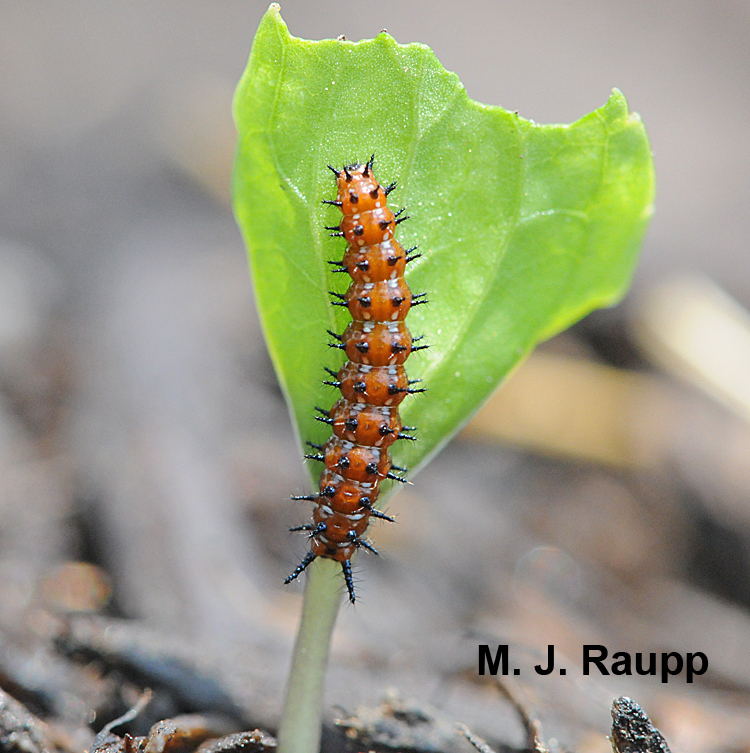 My landscape isn’t rich in these larval food sources, but my flower beds and shady lawn abound in violets, which are another fine food for variegated fritillary caterpillars. Within a breathtaking chrysalis, the caterpillar becomes a butterfly. The caterpillars are gorgeous, bedecked in bright bands of orange and white, and the body is festooned with stout black spines. In addition to consuming my volunteer violets, I discovered several fritillary caterpillars devouring the petals of my pansies. My initial surprise was dispelled after a quick internet search revealed pansies as a card carrying member of the violet clan. Variegated fritillaries will be resident and will complete several generations over the course of the summer here in Maryland. They are one of the last butterflies active in the landscape well into the fall. As the days grow shorter and the nighttimes chillier, the last of the variegated fritillaries will head south for warmer overwintering grounds, or will face a chilly death if real winter returns in 2012. “Now you see it, now you don’t” is the disappearing act fritillary caterpillars perform with pansy petals.